The first two BioShock games have been held in incredibly high esteem. The creepy underwater dystopia of Rapture was home to one of the most powerful and engaging stories ever to grace the next generation console. 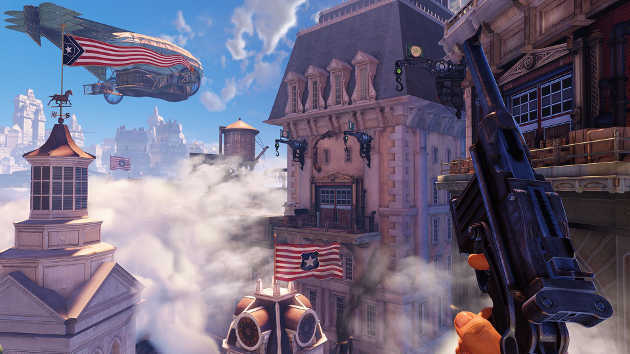 With BioShock Infinite, 2K Games, Irrational Games and Human Head Studios decided to leave the deep lagoon of Rapture behind and focus on the pearly white sky city, Columbia. There was a real threat that this third instalment could step away from more than just the setting. 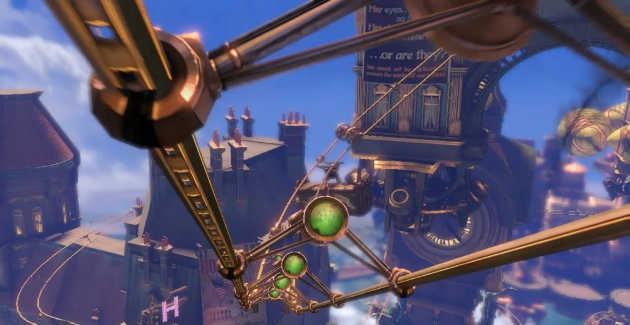 The creepily dank and twisted city of Rapture was all part of a wider theme of the insanity of the masses that made the first two BioShocks such popular games. Stepping into this idyllic cloud city could well have removed all that players loved about the BioShock series in one fell swoop. There’s no room for insanity in paradise, you would assume. Well, BioShock Infinite seems to hit the nail perfectly on the head. This is a city built on the insanity of one man, with danger, shock, as well as twists and turns, all awaiting you around every corner. There is so much that could be said for BioShock Infinite, but it feels as though no words could ever be enough to convey the brilliance that is this game. It’s worth a try though, I guess. The best feature about this game is the story. Video games have an incredibly hard job to do when it comes to building a story. Like a movie it has to be a continuous arc, with as few breaks as possible, otherwise it could become confusing or lack depth. Unlike a movie it has to be experienced in sections, as few gamers will sit and play a game solidly from start to finish like they would watch a film. Thus, the story has to be engaging enough to come back to but not so engaging that it would be difficult to find a natural break. 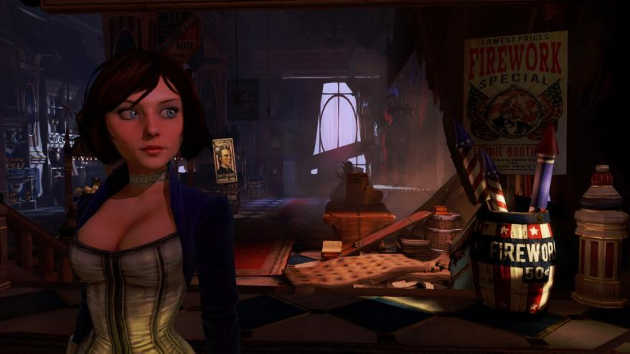 BioShock Infinite executes its story to perfection. Detailed bits of narrative are seamlessly broken up by chunks of combat and map exploration. In the quiet periods, Infinite throws various segments of back story at you, from audio logs in the form of Voxophones and miniature cine reels in the form of Kinetoscopes. These help give depth to the game, as well as fill in small gaps to the main story and connect up those quiet periods of exploration to the main quest. Yet, it never feels like you are being diverted from the job at hand, saving the girl. The girl, in this case, being Elizabeth (movingly voiced by Courtnee Draper) – a Rapunzel like damsel in distress, locked in her tower with just her books, music and giant mechanised guardian bird for company. The player will become Booker DeWitt (brilliantly voiced by Troy Baker), a reluctant hero, whose only goal is to ‘retrieve the girl and wipe away the debt’. Booker isn’t your classic ‘knight in shining armour’; in fact his armour is anything but shiny. As the game develops you will uncover segments of his past that shape your view of him as a man. He’s no hero, at least not at first, anyway. Initially, Elizabeth is merely a means to an end for Booker, a way of clearing his debt. His actions are, at first, malicious – hiding his intentions from the slightly naïve, newly released, Elizabeth. Eventually, once the truth is out, the pair will build a partnership on mutual gain. Elizabeth wants to leave and Booker wants to wipe his debt. But this is just the bottom of the gigantic iceberg that is BioShock Infinite. There is no predictability to this story, even though the premise is so beautifully simple. The setting is, without a doubt, one of the most impressive sights to be found in a game. In the opening twenty minutes, Columbia had the feel of a quaint little American town. A family friendly carnival had been set up for the residents to enjoy, bands played on stands and a Barbershop Quartet sang a rendition of “God Only Knows” on a floating blimp. The townsfolk were clad in turn of the century clothing and every citizen greeted you with a smile and a cheery hello. But, look a little closer and you can spot signs that something isn’t quite right with Columbia. Children smoked cigarettes in a dark corner of the carnival (shocking by today’s standards, but not so much back then) and racist slurs flowed from the mouth of Father Comstock – the religious zealot come self proclaimed prophet. Tensions bubble under the surface of Columbia’s society, with a harsh, racial and rich / poor divide. A secretive organisation in the form of the Vox Populi, threaten to overturn the tyrannical prophet and return Columbia to the people. All of this wonderful back story helps bring Columbia to life. It feels like an American city, it feels alive. Not only this but it looks beautiful too. The city literally floats among the clouds but at no point will you find yourself doubting the reality of this floating paradise. Not that it’s a paradise for long, however – things will quickly turn awry in true BioShock style. The gameplay itself has changed very little from the original titles. The weapons are pretty much the same and the combat system remains relatively unchanged. The Vigors (powers gained through Booker digesting various coloured liquids, much like the plasmids and tonics of the BioShock of old) have had an overhaul, however. They give Booker the ability to force enemies into the air and slam them to the ground, encase them in a whirlpool of water or burn them in an explosive fireball. It’s even possible to place these powers on the floor like mines, waiting to trap unsuspecting enemies. These powers can even be combined together for ultimate destruction. The two biggest changes to gameplay can be found, firstly in the way in which the player navigates around the map. As Columbia is a floating city, it’s necessary for the player to jump from one platform to the other. This experience has been made all the more enjoyable by the introduction of Skylines. These are basically zip-lines that allow players to zip from one platform to another, as well as traverse different levels with ease. Trust me when I say that this is no ugly way to travel. The final change can be found in the involvement of Elizabeth in combat. Elizabeth plays a huge part in how Booker shoots his way through Columbia. During combat she will throw you ammo and health as well as salts (to restore your Vigors). She will also use her ability to ‘open tears’ to bring in allies from parallel dimensions, cover that wouldn’t usually be there and weapons that would otherwise not exist in your world. Agreed, it’s confusing, and you’d be right in wondering why she would have to go to such lengths to help out when she could just as easily pick up a rifle and get her hands dirty. But Elizabeth’s role as Booker’s Guardian Angel is one that the player cannot do without. It’s very noticeable when Elizabeth is removed from the game, ammo is difficult to come by and health seems to be but a distant memory of times gone by. I often found myself relying heavily on her guidance, and even in the quiet parts of the game she will throw you coins that she finds as well as point out hidden loot and lock picks. She truly is an asset to the player, as well as a brilliantly developed character, possibly one of the best female characters in the gaming world. To be perfectly honest, I have barely scraped the surface of the game with this review. There is just so much to love about it. The general atmosphere around Columbia is incredible, the sights and sounds are beautifully rendered and wonderfully chosen, the voice acting is second to none, the combat is engaging and enjoyable and the story drags you deep into this perfect little world that 2K have created. All I can say is, 2K Games, Irrational Games, Human Head Studios and Darkside Game Studios – please, take a bow.